SANTA MONICA, CA, USA: having made momentous musical waves with a show-stopping premiere performance at The 2019 NAMM Show in Southern California, January 24-27, trailblazing pro audio manufacturer Antelope Audio is proud to announce availability of Orion 32+ | Gen 3. Boasting brand-new AD/DA converters capable of achieving up to 129 dB dynamic range alongside Antelope Audio’s next-generation 64-bit AFC (Acoustically Focused Clocking) technology and jitter management algorithm and a rich collection of circuit-level gear emulations running in real-time on an integrated FPGA FX platform, this third-generation improved interface is industry-leading like no other. 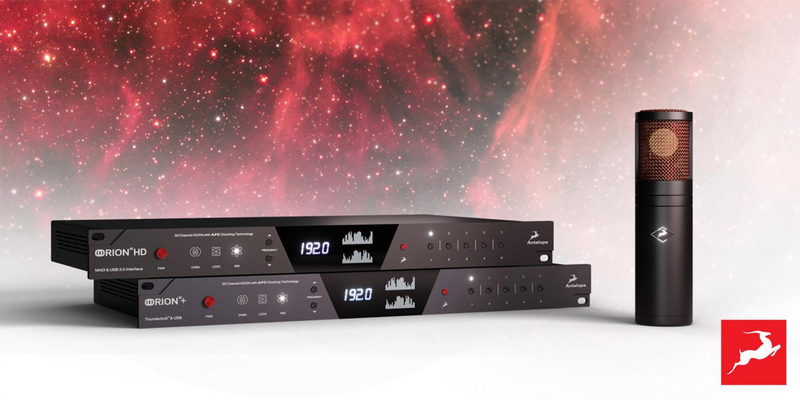 While consummate clocking and conversion are hallowed hallmarks of any Antelope Audio interface, it is the fact that Orion32+ | Gen 3 delivers true sub-millisecond round-trip latency for both AD and DA conversion that also distinguishes it from the (sound of the) crowd. Clearly the trailblazing pro audio manufacturer has some seriously-impressive figures with which to back up this impressive claim — figures that surely speak for themselves with round-trip latency times between line inputs and outputs being measured as low as 0.904ms (64 samples at 192kHz) and line inputs and monitoring outputs as low as 1.155ms (64 samples at 192kHz). Considering AD/DA conversion’s inherent latency and the technical state-of-theart in the pro audio industry, it is currently impossible to achieve sub-millisecond latency under each and every recording and playback scenario. Saying that, the latency achieved in those quoted measurement examples are low enough as to be practically imperceptible. Interfacing is — by its very nature — all about connecting to the outside world. Within the confines of its single rack space-occupying rear panel, Orion32+| Gen 3 packs a lot of connectivity courtesy of 8x DB25 connectors for analogue I/O alongside 2x ADAT, 1x MADI, and 1x S/PDIF digital connections.